Zhou Ming has engaged and obsessed with the complicated traditional process of B&W photography since his early twenties. He has had numerous exhibitions nationally and internationally, and is well known for his “decisive moments” documentary photography. 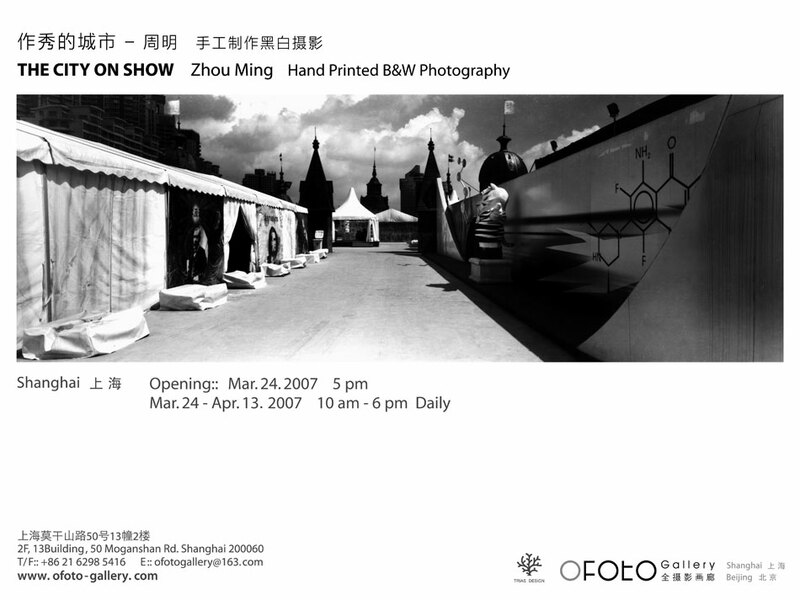 With more than twenty years of persistent darkroom practice and photo-trips all over China, Zhou Ming has developed a flawless photographic technique both on photo taking and dark room printing. Of particular interest is that Zhou Ming redesigned and re-built all his dark room equipment so that it is unique and meets his requirements in his continual search for pefection. He is one of the few photographers today that is not using digital retouch, nor even dark room manipulation. This approach requires a very high level of skill and a rigorous application of the mind when he is taking the pictures. The City On Show, this series of work is the important turning point of Zhou Ming’s from catch-the-moment style to a deeper analytical critical style in his career. Almost excluding the people element, The City On Show is telling stories by what’s in the frame and how they are in the frame to reflect human behavior, in which Zhou Ming has input his critical thinking. With a more and more recognizable art market in Photography, Zhou Ming’s intimate high quality yet affordable art work will be highly sought after. We are pleased to welcome you at OFOTO Gallery.